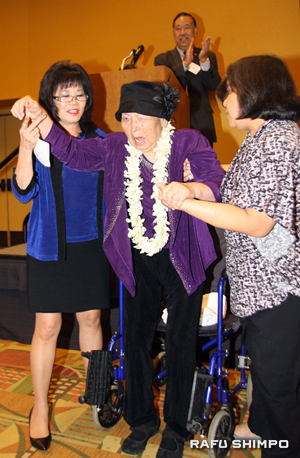 Helen Kawagoe, former Carson city clerk, fighting the after-effects of a severe stroke, stood briefly from her wheelchair, and the 250 gathered at the Pacific Southwest JACL dinner all rose to their feet. Kawagoe, a former JACL national president, was one of the living legends who were honored by the district at the annual awards dinner held on Saturday at the Center at Cathedral Plaza in Los Angeles. With the help of a caregiver and her daughter Sheryl Miyamoto, Kawagoe accepted the award as her daughter explained that her supporters continue to fight for “Helen’s Dream” that the Carson City Council chambers be named in her honor while she still lives. “Her mind is as sharp as a tack. Those who know Helen know she hasn’t changed,” said Miyamoto. Ouchida also shared her vision of where JACL is heading, as it continues its mission to fight for tolerance and social justice for all Americans. Among the issues that it has worked on recently, National JACL recently participated in congressional hearings on the Aug. 5 mass shooting at the Sikh temple in Oak Creek, Wis.
“We need to continue to transform as an organization and as a nation. Every single day we have to remind people about tolerance,” said Ouchida. “Looking forward to where we are going, we’re going to be changing. JACL has to become a Yonsei organization if we’re going to survive in the future,” she said. PSW JACL also recognized Harry Honda, who has been a part of The Pacific Citizen since it moved from Salt Lake City to Los Angeles in 1952. Honda continues to be the community’s historian, penning columns for Pacific Citizen, and also contributing to The Rafu Shimpo. Honda, who was joined by his wife Micki, shared a handwritten scroll that was given to him by Masao Satow, postwar JACL national director, as thanks for all of his efforts to help the organization. George Tanaka, Union Bank senior vice president of retail specialized markets, accepted the Living Legends award on behalf of the bank, and shared that he and his family have become active JACL members, including his daughter, who worked on the Chibi no Gakko summer camp run by the SELANOCO Chapter. “We’re proud of the long-standing relationship between Union Bank and the PSW JACL and all its chapters,” Tanaka said. 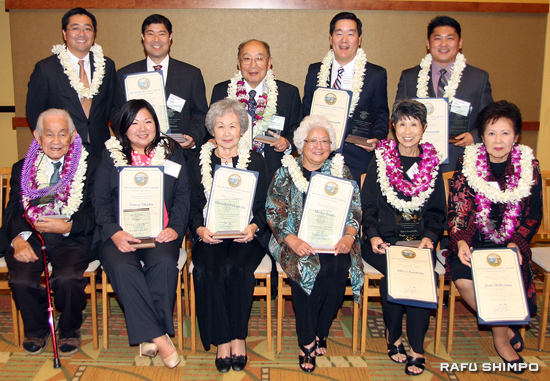 Also honored were individuals who have given long hours of dedication to their local chapters: Mieko Inaba (Riverside), Kerry Kaneichi (Venice-Culver), Jefferson Kunisaki (Ventura), Mitzi Kushida (San Fernando Valley), Nancy Okubo (SELANOCO), Kanji Sahara (Greater L.A. Singles), Masako Takiguchi (Arizona) and Jean Ushijima (West L.A.). A posthumous tribute was awarded to Ed Mitoma of the South Bay Chapter, who passed away in July. Now, I can send this article to more friends around rhe country. Thanks.